GROW is a free bi-lingual app for parents from Shakira, Fisher-Price, AEIOTu, Vroom, Kinedu, Fun Learning and North American Montessori Teachers Association. The app features tips customized to a child’s age to foster early childhood development from birth and through age five, as well as a timeline feature to track developmental milestones. • 1,800+ developmental tips and activities related to social skills, physical development, thinking skills, cognitive development, creativity, communication and more. • Milestone tracker to follow your child’s development and record their achievements. • Timeline to track your child’s milestone progress. Add all the details about what your child did today/tomorrow/the next day, with notes and photos. • Social sharing. Select your favorite tips or photos of your child’s milestone achievements from the timeline, to share with family and friends through Facebook, Twitter, Google+, Instagram or email. • Personalize your child’s profile page with color and photos. More than one child? Add them all! • Easy search function to learn more about what might be coming next for your child’s age and stage. In honor of the app’s launch I have a Move ’n Groove Soccer Ball from the Shakira First Steps Collection created with Fisher-Price to offer as a giveaway for one my lucky readers . 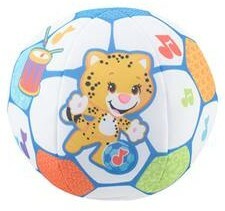 Designed to encourage baby’s development, the soft soccer ball encourages active, motor skill-building play with silly sounds and 11 original global music tunes inspired by music from around the world! The friendly, soft-fabric ball is easy for baby to grasp, bat, roll, toss and kick—with bright colors, touchable textures and musical sounds to help stimulate baby’s senses, too. Win it: One lucky reader will win a Fisher-Price Move ’n Groove Soccer Ball. This giveaway will end March 25th at 11:59 PM EST. The winner will have 24 hours to respond to my email. If no response, a new winner will be chosen. Prize fulfillment will be made by the sponsor, I am not responsible for prize delivery or lost or stolen deliveries. Open to residents of the US. I really like the create and learn app. It can be incorporated to help with counting. I love that you can share acheivements on it! I love that it gives you tips!! I like that it teaches early reading skills. I love that it keeps track of their weight and height. As a teacher and mother, I love that it offers tips for early reading skills. I love the milestones and tips from the app. I love the app, you have useful tips and is good Shakira worry about mothers !! I love the Milestone tracker to follow your child’s development and record their achievements. I love the daily tips that it provides. I like the daily tips feature. I like the timeline feature and the ability to add pictures to it. I like that it lets you share photos and achievements with it. I like that it has a milestone tracker to keep track of your little one's milestones. I like the daily tips. The tips would be very helpful! The music apps are fun. I really like the timeline feature! I like the social sharing feature. I like that it offers tips. I like that it is designed for iPhone and iPad. I like that you can share photos. I like that it keeps track of the weight and height. It keeps my up to date with my child. I love the milestone tracker feature. The milestone part is great and I like the tips offered. the social sharing feature is my favorite. this app is going to be a lot of fun! I like it keeps track of special moments and pictures. I like the daily tips for different age groups. I like the tips and I think that is very helpful. Thanks so much for the chances to win. I like the milestone app. Thanks for the giveaway. I like the daily tips to keep me learning. I love shakira as a musician, but I love that worries for children, who are the most important in the world !! The APP is wonderful and very helpful!! I like how you can create a profile for your child and share special moments and pictures. The daily tips looks helpful.